Seto City has concluded friendship affiliations with Jingdezhen, China, Limoges, France, Nabeul, Tunisia and Korea, Ichoen. Jingdezhen, located in Kiangnan Province of China, about 600km west from Shanghai, has developed as one of the world’s prominent ceramic cities because of the nearby Kaolin Mountain that produces high-quality ceramic raw material (kaolin) and the abundant firewood used as fuel. Jingdezhen is called the “city of ceramic tiles” and has influenced Japanese ceramic culture. 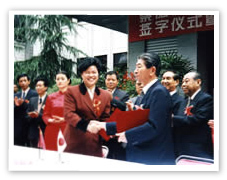 A friendship city agreement with Seto was signed in 1996. Limoges, located on the west side of the central mountain ranges in France, is the regional capital of the Limousin region and also serves as a capital of Haute Vienne prefecture. It takes one hour and ten minutes by air from the Orly airport of Paris to the Bellegarde airport of Limoges and from there a 15 minutes trip by car to the city center. The main industries of Limoges are manufacturing of ceramic ware, footwear, metal products, machinery, electric devices, furniture and automotive parts, as well as printing. Ester Technopole (a space for exchanging technology research information) and nearby universities are implementing research and developing the most advanced technology for use in the ceramics field. 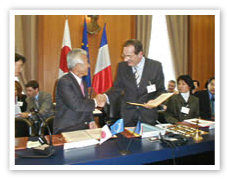 A sister city agreement with Seto was signed in 2003. The Republic of Tunisia is located at the North end of the African Continent, facing the Mediterranean Sea in the north and the east, and the Sahara Dessert in the south. Although Tunisia became independent from France in 1956, the French influence still remains elsewhere. Nabeul is a main city of Cap Bon in the Northern part of Tunisia. The City is famous for its ceramic wares and produces a wide range of ceramics including jugs, pots and vases. The City receives many visitors, from inside and outside of Tunisia, looking for Nabeul pottery. 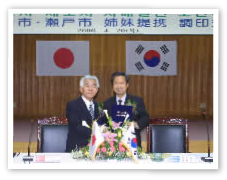 A sister city agreement with Seto was signed in 2004. Icheon is a major city of Kyonggi-do, a prefecture located in the northwest of the Republic of Korea. It is about 50km southeast of Seoul, about an hour’s drive. Blessed with mild climate and crystal stream, it is known as a production district of good rice and fruits. To add, being rich in quality porcelain clay, the city has been prosperous as a town of ceramic art since ancient times. Today, it is a town with the tradition of ceramic art. A large number of ceramic artists, who have gathered in this city, have inherited the tradition of Korean ceramic art. A sister city agreement with Seto was signed in 2006.